Human respiratory syncytial virus (HRSV) can cause severe bronchiolitis in young infants. Part of the pathogenesis of severe HRSV disease is caused by the host immune response. Stimulation of primary human immune cells with HRSV provides a fast and reproducible model system to study activation of inflammatory pathways and infection. Vissers, M., Habets, M. N., Ahout, I. M., Jans, J., de Jonge, M. I., Diavatopoulos, D. A., Ferwerda, G. An In vitro Model to Study Immune Responses of Human Peripheral Blood Mononuclear Cells to Human Respiratory Syncytial Virus Infection. J. Vis. Exp. (82), e50766, doi:10.3791/50766 (2013). Human respiratory syncytial virus (HRSV) infections present a broad spectrum of disease severity, ranging from mild infections to life-threatening bronchiolitis. An important part of the pathogenesis of severe disease is an enhanced immune response leading to immunopathology. Here, we describe a protocol used to investigate the immune response of human immune cells to an HRSV infection. First, we describe methods used for culturing, purification and quantification of HRSV. Subsequently, we describe a human in vitro model in which peripheral blood mononuclear cells (PBMCs) are stimulated with live HRSV. This model system can be used to study multiple parameters that may contribute to disease severity, including the innate and adaptive immune response. These responses can be measured at the transcriptional and translational level. Moreover, viral infection of cells can easily be measured using flow cytometry. Taken together, stimulation of PBMC with live HRSV provides a fast and reproducible model system to examine mechanisms involved in HRSV-induced disease. Human Respiratory Syncytial Virus (HRSV) is the most common cause of lower respiratory tract infections in children. Each year, over 33 million children under the age of five are infected with HRSV, leading to over three million hospitalizations and almost 200,000 deaths1. A growing body of evidence suggests that HRSV also poses a significant threat to the elderly and adults with underlying chronic illnesses2. The majority of HRSV infections in young children presents with mild symptoms, comparable to the common cold, and do not require clinical intervention. However, a small proportion of patients require hospitalization and mechanical ventilation due to severe bronchiolitis. Part of the pathogenesis of HRSV disease is the host's overexuberant and inadequate immune response to infection3,4. This is illustrated by several observations. The period of maximal illness is often preceded by the peak of viral infection and coincides better with cellular infiltration of infected tissues and the release of inflammatory cytokines3. Another line of evidence comes from the formalin inactivated HRSV (FI-RSV) trials in the 1960s. Instead of inducing protection in young infants, the vaccine resulted in an exaggerated immune response resulting in enhanced respiratory disease and higher morbidity and mortality. Several models have been developed to study the pathogenesis of HRSV infections. Continuous cell lines, like HEp-2 and A549, have been used extensively to study HRSV infection in vitro. Epithelial cells are the primary targets of HRSV infection5, therefore a lot of focus has been on these cell types. However, the in vivo situation is much more complex and not limited to one cell type. In order to examine these complex interactions, several animal infection models have been developed to study HRSV pathogenesis. Thus far, two different strategies have been employed, focusing either on heterologous (nonhuman) models as well as cognate host-pneumovirus models. Examples of heterologous models for HRSV include chimpanzees, sheep, cotton rats and mice. RSV infection in its natural host has been studied in cattle and in mice, using bovine RSV and pneumovirus, respectively. Whilst each of these models has provided important insights into disease pathogenesis, HRSV is highly adapted to humans. Therefore, as an addition to the cell lines and animal models currently used, we propose to use human primary PBMCs as a model for stimulation with HRSV. Human PBMCs can be obtained from a range of individuals to address specific research questions, including young children6, immunocompromised individuals as well as healthy adults7 or elderly individuals8. PBMCs can be used to study innate aspects of infection as well as the adaptive response to the virus. Activated inflammatory pathways important for the pathogenesis of HRSV disease can be studied at the mRNA and protein level. Further, viral infection of (subsets of) immune cells can be determined by flow cytometry. We have used this model previously to identify the synergistic effects of HRSV infection together with the bacterial ligand muramyl dipeptide (MDP) on the induction of proinflammatory cytokines7. We propose to use HRSV stimulation of human primary PBMCs as a robust, easy and fast in vitro model to study inflammatory pathways involved in the pathogenesis of HRSV disease. Experiments with HRSV must be performed in a biological safety cabinet in a biosafety level 2 laboratory. Collect all viral waste and material that has been in contact with the virus for proper disposal due to biological hazards. Special precaution must be taken when using potentially infected human blood. It is crucial to use endotoxin-free reagents throughout all protocols. Culture HeLa or HEp-2 cells in DMEM medium + 10% fetal calf serum (FCS) + 1% penicillin/streptomycin (P/S) in a 175 cm2 culture flask until they are approximately 50% confluent. Wash the cells three times with room temperature phosphate buffered saline (PBS). Thaw a vial with HRSV seeding stock virus at 37 °C in a water bath. Dilute the virus stock so to keep the MOI 0.1 or below. This will prevent the generation of defective interfering particles (DIPs). Dilute the virus stock in 4 ml/flask infection medium (DMEM + 1% P/S) and add to the HeLa or HEp-2 cells. Keep this volume as low as possible without causing the cells to dry out. The lower the volume the higher the infection rate will be. Incubate 2-4 hr at 37 °C, 5% CO2. Swirl the flask every 15 min to redistribute the medium. Take off the inoculum and wash one time with PBS. Add 15 ml culture medium (DMEM + 10%FCS + 1% P/S) and incubate for 3-5 days at 37 °C, 5% CO2. Observe the cells with normal bright field microscopy for virus-induced cytopathological changes, e.g. syncytia formation and death and floating cells. When cytopathology appears, harvest HRSV by scraping cells and collect the virus suspension in a sterile 50 ml tube. Vortex the cell suspension. Scraping and vortexing of the cells releases more viral particles. Centrifuge the virus suspension for 10 min at room temperature at 1,800 x g to pellet the cell debris. HRSV in the supernatant does not pellet at this speed and the supernatant can be directly used to infect multiple 175 cm2 flasks or can be stored at -80 °C as seeding stock in 1 ml aliquots for future use. Always snap-freeze HRSV in liquid nitrogen to prevent loss of infectious virus particles. As stated above, the seeding stock made with the above protocol is used to infect multiple 175 cm2 culture flasks. Repeat the exact protocol to produce more virus for purification. Purify up to 180 ml of virus suspension in one ultracentrifugation cycle. When cytopathology appears, harvest HRSV by scraping cells and collect supernatant. Vortex the virus suspension. Centrifuge for 10 min at room temperature at 1,800 x g to pellet the cell debris. HRSV in the supernatant does not pellet at this speed and the supernatant is aliquotted in 15 ml per 50 ml tube. Snap-freeze and store at -80 °C until purification. Note: Before using an ultracentrifuge, be aware that it is a potentially dangerous piece of equipment. Read the manuals and perform the first ultracentrifugation spin under supervision of someone with experience. Clean ultracentrifugation buckets with 70% ethanol and let them dry in a biological safety cabinet. Place a sterile centrifuge tube in each bucket. Prepare 30% (w/v) sucrose in PBS solution, filter sterilize (0.2 μm filter) and add 5 ml to the bottom of each centrifuge tube. For a faster protocol, the tubes with sucrose solution can be frozen. Be sure to keep them sterile. If the sucrose solution was not frozen, very carefully add 30 ml of HRSV solution on top of this sucrose solution. Pipette slowly to avoid disturbing the sucrose solution. Keep a clear demarcation. If the tubes were frozen, pour the viral suspension on top of the frozen sucrose solution and then let it thaw. Very carefully balance the six ultracentrifugation buckets with sterile PBS. Put the scale into a flow cabinet to keep everything sterile. Fill the tubes until 3-5 mm below the edge otherwise the centrifuge tubes can collapse. Balance the buckets to within 0.1 g and include the screw-on cap, just in case the caps are not perfectly matched. Centrifuge in the ultracentrifuge for 1.5 hr, 4 °C at 20,000 rcf. Carefully remove the centrifuge tube from the bucket using sterile forceps. Virus particles will have passed through the sucrose layer and form a pellet. Conversely, cell-secreted soluble factors (e.g. cytokines) will stay in solution. Tip the centrifuge tube to drain all the liquid. Leave it upside-down on a sterile surface, e.g. a culture plate, to dry but don't let the pellet completely dry out. Carefully add 1 ml Hank's Balanced Salt Solution (HBSS) to the pellet and tip the centrifuge tube to drain the HBSS. Again let the tube dry upside-down on a sterile surface. Don't let the pellet completely dry out. Resuspend the pellet in 1 ml HBSS by pipetting up and down 40x. Try to prevent air bubble formation as this can destroy the virus. Aliquot the virus, snap-freeze in liquid nitrogen and store at -80 °C until further use. Use a new aliquot of virus for each experiment, as repeated freeze-thawing will reduce the infectious titer. When thawing, always thaw the virus at 37 °C as HRSV is less stable between -20 and 15 °C. Note: To ensure reproducible data, repeat the quantification at least 3x in duplicate. Culture A549 cells in a 24-well plate until confluent. Wash the A549 cells two times with 1 ml of PBS at room temperature. Prepare 5-fold serial dilutions of HRSV in Reduced Serum Medium. Add 100 μl of diluted virus to both wells. Make a minimum of 4 dilutions (e.g. 4-, 20-, 100-, and 500-fold). Include two extra wells infected with the highest dose of virus (these will be used for the isotype control) and include two mock-infected wells. Incubate the cells for 2 hr at 5% CO2, 37 °C. Rock the 24-well plates every 15 min to prevent drying out. Remove the virus suspension and wash the cells 1x with 1 ml of PBS at room temperature. Prepare 4% (w/v) bovine serum albumin (BSA) in Reduced Serum Medium. Filter-sterilize (0.2 μm filter) and add 500 μl to each well. Incubate at 5% CO2, 37 °C for 22 hr. Remove medium and wash cells one time with 1 ml of room temperature PBS. Add 200 μl of prewarmed trypsin (37 °C) to each well and incubate for 10 min at 37 °C, 5% CO2. Check cells for detachment under the microscope. If cells are detached, add 800 μl DMEM + 10% FCS + 1% P/S to neutralize the trypsin. Resuspend the cells. Transfer the cells to a conical, nontissue culture treated 96-well plate. Centrifuge 5 min at 400 x g at room temperature. Resuspend the pellets in 200 μl cold PBS. Centrifuge 5 min at 400 x g at 4 °C. Decant the supernatant and resuspend in 200 μl cold PBS. Centrifuge 5 min at 400 x g at 4 °C. Decant the supernatant and resuspend in 150 μl 80% ice-cold acetone. Fixate the cells at room temperature for 15 min. Centrifuge 5 min at 400 x g at 4 °C. Decant the supernatant and resuspend in 200 μl cold PBS + 0.1 % BSA. Centrifuge 5 min at 400 x g at 4 °C. Decant the supernatant and resuspend in 50 μl anti-NP-RSV-FITC (1:50 diluted in PBS + 1% BSA) or 50 μl IgG2 anti mouse-FITC (this is an isotype control; therefore use same antibody concentration). For the remainder of the protocol, keep tubes in dark. Incubate at least 1 hr at 4 °C but this can be extended to overnight. Add 150 μl cold PBS + 0.1% BSA. Centrifuge 5 min at 400 x g at 4 °C. Decant the supernatant and resuspend in 200 μl cold PBS + 0.1% BSA. Centrifuge 5 min at 400 x g at 4 °C. Decant the supernatant and resuspend in 200 μl cold PBS + 0.1% BSA. Keep plate on ice and in the dark until FACS measurement. Measure the infected cells on a flow cytometer. Use a flow cytometry analysis program to set the cutoff using the negative control (isotype control). Use the Pseudocolor graph type. Draw a quadrant gate, where the positive cells are in field Q3. The percentage of false positives should be below 0.2% in both isotype controls. Export the data to a spreadsheet program and prepare a table with the percentage of FITC+ cells for each dilution. Subtract the average value of false positives (as determined by the isotype control) for each experiment for each value. Open a new file (XY scatter, Single X and multiple Y columns) in a statistics program. Copy data to this program: X = dilution, Y = % infected cells, n = 3, use the average of two measurements for each dilution. Perform a nonlinear regression, one-phase exponential decay statistical analysis. Check if the curve fits the data points, if not, choose a different statistical analysis. Draw venous blood in 10 ml EDTA tubes from healthy volunteers upon informed consent. A volume of 10 ml of blood will yield approximately 107 PBMCs. From now on, work sterile in a flow-cabinet. Dilute the blood 2x with room temperature PBS in a 50 ml tube. Per 50 ml tube a maximal total volume of 35 ml of diluted blood can be used. Take a 50 ml sterile syringe and add a sterilized Luer lock needle. Take up density gradient media in the syringe. Place the needle on the bottom of a tube with diluted blood and carefully pipette 15 ml density gradient media under the diluted blood. Keep a clear demarcation between density gradient media and blood. Centrifuge at 800 x g at room temperature for 20 min with acceleration at 9 (max) and the brake off. Set the temperature of the centrifuge to 4 °C after use. The density gradient centrifugation will result in multiple layers. On the bottom a pellet with erythrocytes is present with a silvery layer on top, which contains the neutrophils. The clear layer above this pellet contains the density gradient media. A thin layer between the density gradient media and the blood plasma layer on top contains PBMCs. Carefully collect the PBMCs with a Pasteur pipette and transfer cells to a new 50 ml tube. From now on keep the PBMCs on ice and use ice-cold PBS. Add ice-cold PBS to a volume of 50 ml and centrifuge at 400 x g for 10 min at 4 °C (with the brake set at 9). Discard the supernatant by aspiration, resuspend the pellet in 50 ml of ice-cold PBS and centrifuge at 400 x g 10 min at 4 °C, repeat 2x. After discarding the supernatant, add 1 ml of ice-cold medium (RPMI + 1% P/S) and count cells using a counting chamber. Adjust the cell concentration to 5 x 106 PBMCs/ml. Prepare a setup of the experiment; include experimental duplicates for each condition. Dilute all necessary stimuli in medium (RPMI + 1% P/S). Keep in mind that the final volume per well will be 200 μl. A volume of 50 μl of stimuli will be added so prepare 4x concentrated stimulation stocks. Add 100 μl of the above mentioned cell suspension to each well of a round bottom 96-well plate (5 x 105 PBMC/well). Add 50 μl of the diluted stimuli to each well. It is possible to add two different stimuli, which gives a volume of 200 μl. If only one stimuli is needed adjust the volume to 200 μl with medium. Incubate the 96-well plate for the required incubation period at 37 °C in a 5% CO2 incubator. For most cytokines 24 hr of incubation will be sufficient. After the incubation period, centrifuge the 96-well plate for 5 min at room temperature at 450 x g to collect the cells at the bottom. Collect the supernatant (take a maximal volume of 180 μl) and store for subsequent cytokine analysis (-20 °C) or for virus production (-80 °C). The stimulated PBMCs that are present in the pellet can either be analyzed by qPCR/Western blot by adding lysis buffer or alternatively, PBMCs can be stained for flow cytometry analysis. The HRSV A2 cultivation and purification method described here will give a yield between 2 x 107 and 2 x 108 FITC-50 quantified infectious viral particles/ml. Results of microscopic analysis, where FITC-stained infected cells were counted (results not shown), were compared to results of quantification by FACS (Figure 1). Both methods resulted in similar titers, although the FACS method had a much lower standard deviation between different experiments and was less laborious. When performing a PBMC stimulation experiment we recommend using the stimuli-fraction method. With this method the conditions are divided in stimuli conditions and fraction conditions (Figure 2). The stimuli conditions are the standard conditions (e.g. RPMI and HRSV). The fraction conditions are the test conditions (e.g. RPMI, MDP, and LPS). Always include a negative control and a positive control in each experiment. In this experiment LPS is the positive control and RPMI is the negative control. LPS can often be used as a positive control when proinflammatory cytokines will be measured such as TNFα and IL-1β. The stimuli-fraction method prevents the omission of important control conditions. After 24 hr of stimulation different cell types present in the PBMC showed a dose-dependent infection rate (Figure 3). Different cell types show a difference in efficiency of HRSV infection. 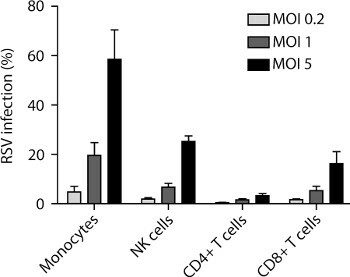 HRSV was able to infect monocytes and NK cells at a lower MOI value compared to CD4+ T cells and CD8+ T cells. After 24 hr of stimulation the PBMCs are lysed and analyzed by qPCR for the expression of TNF-α and IFN-γ (Figure 4). TNF-α is a cytokine that is mainly produced by monocytes and is therefore often regarded as a typical innate cytokine. IFN-γ can be produced by various cell types, including NK cells and T cells, and therefore represents both the innate as well as the adaptive response. As shown in Figure 4, HRSV strongly upregulated TNF-α and IFN-γ transcription. Conversely, stimulation with MDP and LPS only results in a weak expression increase. However, when PBMCs are stimulated with both HRSV and MDP together, a strong synergistic upregulation is observed. Stimulated PBMCs were also analyzed for the secretion of TNF-α and IFN-γ by ELISA (Figure 5). For both cytokines, the negative control remains negative. Whilst LPS is a good positive control for TNF-α, it does not induce IFN-γ. A better control for IFN-γ production may be to stimulate PBMCs with Candida albicans, which is known to induce IFN-γ. In contrast to observations at the transcriptional level, HRSV is a poor inducer of IFN-γ and TNF-α protein secretion by PBMC. Stimulation with MDP results in the detection of low amounts of TNF-α and no IFN-γ. Similar to the transcriptional analysis, both TNF-α and IFN-γ show a synergistic upregulation when costimulated with HRSV and MDP. As a control to see whether cytokine induction is dependent on replication of HRSV, we stimulated PBMCs with live and BPL inactivated HRSV9. As can be seen in Figure 6, inactivated HRSV is also recognized by immune cells and induces inflammatory cytokines. Figure 1. Quantification of HRSV A2 by flow cytometry. (A) Representative FACS plot of HRSV infected A549 cells that are stained with anti-HRSV nucleoprotein antibody conjugated to FITC. A negative (field Q4) and positive (field Q3) population is clearly distinguishable. (B) Dose response curve of the % of HRSV-infected A549 cells is set out against the dilution. The number of FITC-detected infectious particles/ml is determined at the dilution at which there is 50% infection. Data are presented as mean +/- SEM of the pooled duplicates of 3 experiments, and fitted with a one-phase exponential decay curve. Figure 2. Schematic diagram of a stimulation experiment of human PBMCs in a 96-well plate. Always include duplicates for each condition and include positive and negative controls. Figure 3. Different PBMC cell types are infected with different susceptibility and in a dose-dependent manner. PBMCs isolated from four healthy volunteers were stimulated with fluorescent HRSV A2 (MOI = 0.2, 1, and 5). After 24 hr of incubation at 37 °C PBMCs were stained with antibodies against CD14 (monocytes), CD56 (NK cells), CD3 and CD4 (CD4+ T cells) or CD3 and CD8 (CD8+ T cells). Data are presented as mean percentage of infection + SEM and represent two individually performed experiments. Figure 4. Costimulation with HRSV and MDP results in synergistic upregulation of TNF-α and IFN-γ expression. PBMCs isolated from five healthy volunteers were stimulated with HRSV A2 (MOI = 1), MDP (5 μg/ml) or LPS (1 ng/ml), or a combination of stimuli. TNF-α and IFN-γ transcription was measured by quantitative PCR and expressed as fold-increase compared to unstimulated cells. Cells were lysed after 24 hr of incubation at 37 °C. Data are presented as mean + SEM of the pooled duplicates of all five samples and represent a minimum of two performed experiments. Figure 5. Costimulation with HRSV and MDP result in a synergistic increase of TNF-α and IFN-γ secretion. PBMCs isolated from five healthy volunteers were stimulated with HRSV A2 (MOI = 1), MDP (5 μg/ml) or LPS (1 ng/ml), or a combination of stimuli. The levels of TNF-α and IFN-γ in culture supernatants were measured by ELISA after 24 hr of stimulation at 37 °C. Data are presented as mean + SEM of the pooled duplicates of all five samples and are representative of minimal two experiments performed. Figure 6. Both live HRSV as BPL inactivated HRSV induce proinflammatory cytokine responses. PBMCs from four healthy volunteers were stimulated with HRSV A2 (MOI = 1) or the same dose of BPL inactivated HRSV (RSV-BPL). The levels of TNF-α and IFN-γ in culture supernatants were measured by ELISA after 24 hr of stimulation at 37 °C. Data are presented as mean + SEM of the pooled duplicates of all four samples and are representative of minimal two experiments performed. In this study, we demonstrate that infection of PBMC with HRSV is a fast and reliable model system in which inflammatory pathways can be studied. In order to stimulate PBMCs an HRSV stock has to be prepared and quantified. Multiple cell lines are susceptible to HRSV infection. Cell lines most used for HRSV culturing are HEp-2, HeLa, and Vero cells. However, we would not recommend the usage of Vero cells for culturing of HRSV because it has been shown that culturing of HRSV in Vero cells results in a truncated G-protein of HRSV10. Also, always use low amounts of virus to infect the cells for culturing because of the risk of generating defective interfering particles11. Defective interfering particles (DIPs) are viral particles that miss part or all of their genome. DIPs can therefore not sustain an infection by themselves but rely on infectious virus. Due to their small genomes they are more efficiently replicated than a fully functional virus, which can result in large numbers of noninfectious particles. These DIPs cannot be measured by quantification techniques relying on replication. However, they probably will be recognized in a stimulation experiment of immune cells. Therefore, it is crucial to keep them as low as possible. Treuhaft et al. have shown that when HRSV is cultured using an MOI of 0.1, they were not able to detect DIPs after 8 passages11. For reproducibility between different batches of virus, an accurate determination of the number of infectious particles/ml is important. Standard methods for HRSV quantification are plaque formation and TCID50 determination on HEp-2 or HeLa cells. As HRSV is a poorly-cytopathic virus, cytopathogenic effect (CPE) detection can be hard and is therefore subjective. Usage of fluorescent antibodies can solve the problem with subjectivity. However, both methods require lengthy incubation. Our described method of quantification of HRSV using flow cytometry has proven to be fast and reproducible. Similar protocols have been described for other viruses12. In this study, we demonstrated how PBMCs can be stimulated with live HRSV. We showed that different cell types in PBMCs are infected by HRSV. They showed a dose-response to HRSV infection and different cell types showed a different susceptibility. We also demonstrated that whilst stimulation with HRSV alone induces an appreciable upregulation of inflammatory genes at the mRNA level, only low amounts of IFN-γ and TNF-α were secreted. However, costimulation with a bacterial ligand, i.e. MDP, induces a synergistic increase in proinflammatory cytokine production. In a previous study we showed that this model system can very easily be adapted to study inflammatory pathways induced by other viruses, e.g. influenza or rhinovirus7. To account for interindividual variation with human primary cells, stimulation experiments of PBMCs should be performed with at least five donors and in two separate experiments. For instance, the responses of human PBMCs to e.g. LPS are known to be divided into high responders and low responders13. These highly variable responses can be caused by differences in cell counts between individuals, but also by differences in the intrinsic capacity of these cells to respond to stimuli. Especially in the context of HRSV infections, which show such a broad spectrum of severities, this interindividual variation could also lead to interesting observations regarding individual differences in susceptibility or immune response. Due to the fact that donors can be divided in high and low responders, nonparametric statistical methods should be used in analyzing cytokine data. Whilst many studies have used continuous cell lines, e.g. A549 cells, to study the response to HRSV infection, cell lines are very different from primary cells and may therefore not always reflect the biological situation in vivo. Although epithelial cells are generally regarded as the primary cells infected by HRSV5, the immune cells present below and between the epithelial cells play a very important role in disease pathogenesis14,15. Thus, excluding these cells from the experimental setup disregards an important part of the host response. Epithelial cells with a higher relevance are the normal human bronchial epithelial cells (NHBEs)16, which are primary bronchial cells that can be differentiated into ciliated mucus producing cells. These NHBEs can be polarized in a transwell system on an air-liquid interface and therefore resemble the airway epithelium much better. An example of how the complex interplay between epithelial cells and immune cells can be mimicked in vitro is by adding PBMCs to the basolateral side of polarized NHBE cells, which creates a situation that may be more comparable to the in vivo situation. Inflammatory pathways can also be tested using whole blood. Whole blood stimulations are even faster and require fewer resources compared to PBMC stimulations. However, it is important to note that PBMCs do not contain plasma proteins. Blood plasma contains many proteins, including complement proteins, cytokines and antibodies. Because every individual above the age of two will have encountered an infection with HRSV, blood plasma will contain HRSV-specific neutralizing antibodies. Infection of cells in the presence of human serum or plasma is therefore not possible. The biggest advantage of animal models is that it creates the opportunity to examine HRSV infection in vivo. Whilst this complex interplay of cells cannot be mimicked using PBMCs, it should be noted that no animal model to date has reproduced the total range of pathologies seen in HRSV infected humans. Consequently, human PBMCs remain relevant to study HRSV infections. A major benefit of using PBMCs is the availability of multiple patient groups that can be compared. For instance, PBMCs from the elderly can be used as well as from immunocompromised adult patients. As HRSV is especially prone to infect very young infants, PBMCs from these age groups and/or patient groups are especially relevant to use. Stimulation experiments as described above are already feasible with an amount of 3 ml of blood. In addition, previous studies have shown that these experiments can also be performed on PBMCs from cord blood17. In conclusion, the procedures described in this paper offer a reproducible and easy to use method to examine mechanisms involved in HRSV-induced disease. RSV A2 was kindly provided by Dr. R. de Swart (Erasmus MC, Rotterdam, The Netherlands). MV and GF are supported by the Virgo consortium, funded by the Dutch government project number FES0908, and by the Netherlands Genomics Initiative (NGI) project number 050-060-452. The funders had no role in study design, data collection and analysis, decision to publish, or preparation of the manuscript. Nair, H., Nokes, D. J., et al. Global burden of acute lower respiratory infections due to respiratory syncytial virus in young children: a systematic review and meta-analysis. Lancet. 375, 1545-1555 (2010). Falsey, A. R., Hennessey, P. A., Formica, M. A., Cox, C., Walsh, E. E. Respiratory syncytial virus infection in elderly and high-risk adults. N. Eng. J. Med. 352-1749 (2005). Openshaw, P. J. Antiviral Immune Responses and Lung Inflammation after Respiratory Syncytial Virus Infection. Proc. Am. Thorac. Soc. 2, (2), 121-125 (2005). Openshaw, P. J., Tregoning, J. S. Immune responses and disease enhancement during respiratory syncytial virus infection. Clin. Microbio. Rev. 18, (3), 541-555 (2005). Villenave, R., Thavagnanam, S., et al. In vitro modeling of respiratory syncytial virus infection of pediatric bronchial epithelium, the primary target of infection in vivo. Proc. Natl. Acad. Sci. U.S.A. 109, (13), 5040-5045 (2012). Tulic, M. K., Hurrelbrink, R. J., Prêle, C. M., Laing, I. A., Upham, J. W., Le Souef, P., Sly, P. D., Holt, P. G. TLR4 polymorphisms mediate impaired responses to respiratory syncytial virus and lipopolysaccharide. J. Immunol. 179, (1), 132-140 (2007). Vissers, M., Remijn, T., et al. Respiratory syncytial virus infection augments NOD2 signaling in an IFN-β-dependent manner in human primary cells. Eur. J. Immunol. 42, (10), 2727-2735 (2012). Cherukuri, A., Patton, K., Gasser, R. A. Jr, Zuo, F., Woo, J., Esser, M. T., Tang, R. S. Adults 65 years old and older have reduced number of functional memory T cells to respiratory syncytial virus fusion protein. Clin. Vacc. Immunol. 20, (2), 239-247 (2013). Shafique, M., Wilschut, J., de Haan, A. Induction of mucosal and systemic immunity against respiratory syncytial virus by inactivated virus supplemented with TLR9 and NOD2 ligands. Vaccine. 30, 597-606 (2012). Kwilas, S., Liesman, R. M., Zhang, L., Walsh, E., Pickles, R. J., Peeples, M. E. Respiratory syncytial virus grown in Vero cells contains a truncated attachment protein that alters its infectivity and dependence on glycosaminoglycans. J. Virol. 83, (20), 10710-10718 (2009). Treuhaft, M. W., Beem, M. O. Defective interfering particles of respiratory syncytial virus. Infect. Immun. 37, (2), 439-444 (1982). Korns Johnson, D., Homann, D. Accelerated and improved quantification of lymphocytic choriomeningitis virus (LCMV) titers by flow cytometry. PLoS One. 7, (5), e37337 (2012). Wurfel, M. M., Park, W. Y., et al. Identification of high and low responders to lipopolysaccharide in normal subjects: an unbiased approach to identify modulators of innate immunity. J. Immunol. 175, (4), 2570-2578 (2005). Kimpen, J. L. Respiratory syncytial virus and asthma. The role of monocytes. Am. J. Respir. Crit. Care Med. 163, 7-9 (2001). Wang, S. Z., Forsyth, K. D. The interaction of neutrophils with respiratory epithelial cells in viral infection. Respirology. 5, (1), 1-10 (2000). San-Juan-Vergara, H., Sampayo-Escobar, V., Reyes, N., Cha, B., Pacheco-Lugo, L., Wong, T., Peeples, M. E., Collins, P. L., Castano, M. E., Mohapatra, S. S. Cholesterol-rich microdomains as docking platforms for respiratory syncytial virus in normal human bronchial epithelial cells. J. Virol. 86, (3), 1832-1843 (2012). Davidson, D., Zaytseva, A., Miskolci, V., Castro-Alcaraz, S., Vancurova, I., Patel, H. Gene expression profile of endotoxin-stimulated leukocytes of term new born: control of cytokine gene expression by interleukin-10. Plos One. 8, (1), e53641 (2013).